Santa Fe (pics) is the state capital of New Mexico and at 7,000 feet above sea level, is the highest capital city in the United States. It also lays claim as the oldest capital city at over 400 years. Let me ‘splain. The Spanish explorers pushed north from Mexico in search for gold during the mid-1500’s, reaching as far as Santa Fe and established it as the capital of Nuevo Mexico in 1610, thus over 400 years as a capital city. It wasn’t until 1912 that New Mexico was admitted to the United States as its 47th state. This followed the Mexican-American war in the mid-1800’s and the subsequent Treaty of Guadalupe Hidalgo that ceded nearly all of California, Nevada, Utah, Arizona, Colorado and New Mexico to the U.S. Santa Fe remained the capital city of the newly admitted state. We visited the capitol building. It is the only round capitol building in the U.S. If you could view the building from above, its design mimics the all important Zia sun symbol. The Zia was an indigenous tribe centered on the Zia Pueblo in New Mexico. The Zia symbol is also featured on the New Mexico state flag. 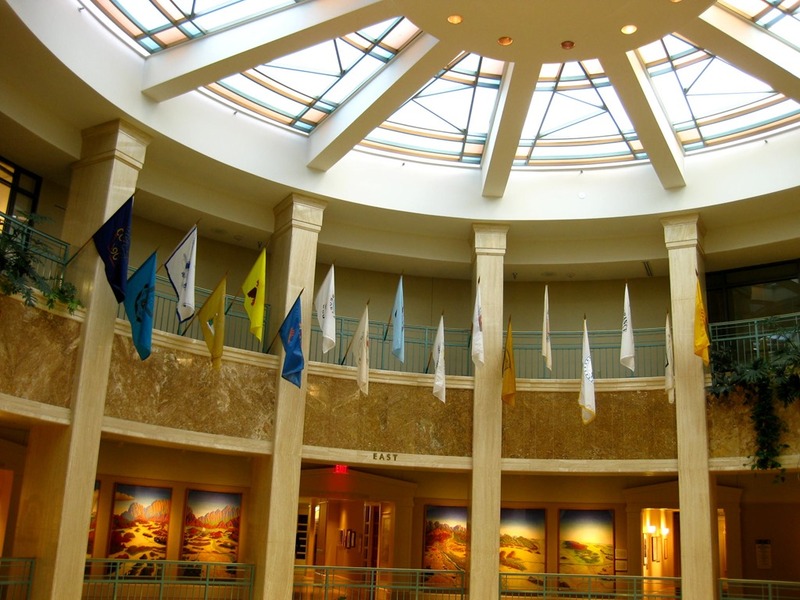 The capitol building has an extensive art collection representing the many fine artists that call New Mexico home. We were allowed to self guide through the entire building. The original capitol building was established in 1609 as The Palace of the Governors. The current capitol building was built in 1966 and extensively renovated in the early 1990’s. 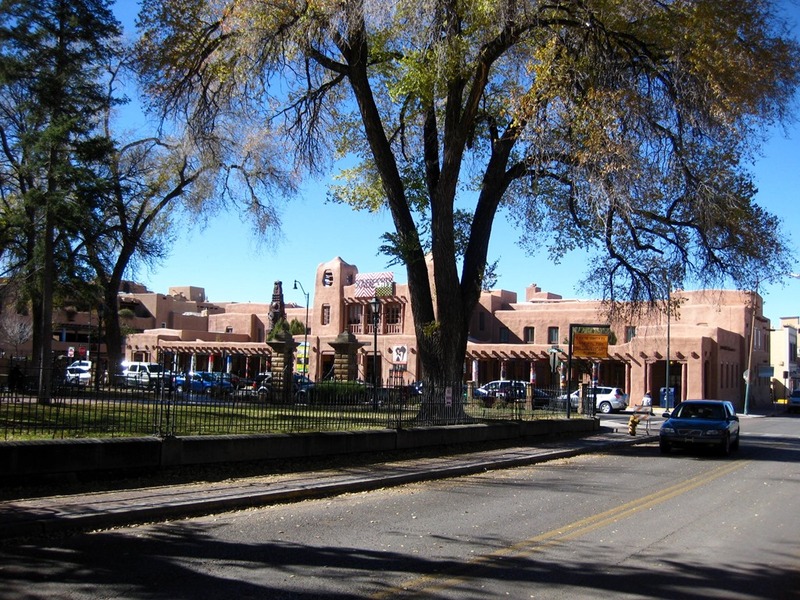 Santa Fe’s history is highly revered and carefully maintained. The area around the historic central plaza reflects Native American and Spanish culture and architecture. There are lots of art galleries and markets for the works of native artisans. We were able to visit the Saturday morning farmer’s market which is held in an area called the Railyard district. 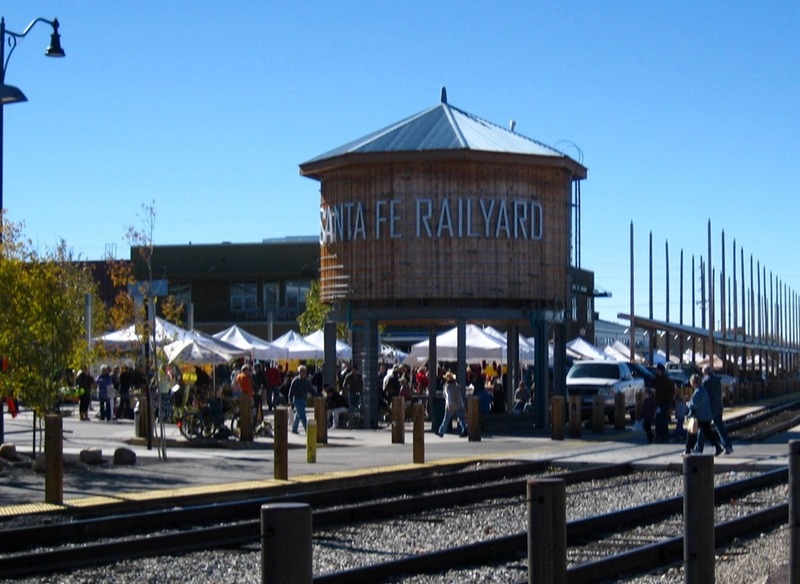 Santa Fe was an important rail terminal and this area maintains that history with its current Rail Runner passenger service to Albuquerque. The farmer’s market was a lively and festive affair with the usual assortment of fresh vegetables, prepared local favorites and music. The people here are an interesting mix of the Native American and Spanish cultures with the largely upper middle class Caucasians who are attracted to Santa Fe for its art and culture. It’s not hard to see why many artists are attracted to this area. The air is clean, the colors of the surrounding mountains provide a changing palette reflecting the sun with a variety of shades. As usual, very interesting history and beautiful pics. Have fun and drive carefully!